There are a number of benefits to a burr coffee grinder as opposed to the blade grinders. Burr grinder machines can be more expensive, but can also offer a series of great features which make them the default choice for all those who are serious about their coffee. During the process of burr grinding more of the beans’ essential oils are released, meaning that the coffee is richer and smoother when brewed. Burr grinding machines can produce ground coffee suitable for use in almost all of the sorts of coffee makers in the home, apart from the especially fine ground coffee required for making Turkish coffee. The main advantage of burr grinders is that they give the same results each and every time, meaning consistently good coffee. The burr grinder takes longer to grind up the beans, meaning that there is less heat due to the friction from moving parts and no danger of the beans getting burned. Of course this does mean that the grinding of the beans takes marginally longer than using a blade grinder, but the slightly longer time is well worth the wait. Consistently out-performing the other brands in consumer tests, the KitchenAid Pro Line Burr Coffee Grinder is the best on the market. Firstly, the design is attractive, sleek and has a retro feel to it just like the same company’s iconic food mixer. The cutting burrs themselves are adaptable, and this allows you to adjust it for 15 different grind sizes. The machine is reliable and well-engineered, and as KitchenAid is a very well-known name in the world of kitchen appliances, the reputation of the brand means that you are assured of a quality product. 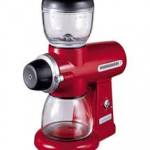 So confident are KitchenAid in their product, the burr grinder comes with a two year no hassle guarantee which will replace or repair if the machine breaks down. The engineering quality is very good though, and the motor which drives the machine is reliable and breakdowns are very rare. KitchenAid products are widely available through specialist stores, homeware stores and online, and this level of competition means that shopping around should achieve the best price. The KitchenAid is not the most expensive burr grinder on the market as it retails around the $200 mark. However, the quality versus value for money makes it a very attractive purchase and valued addition to any kitchen. It is even available in a range of colors – red, gray, cream and black – meaning that it will look at home whatever your color scheme.